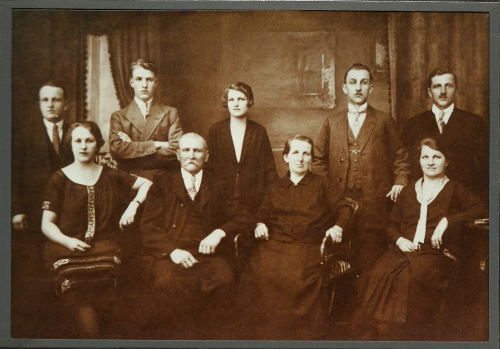 In 1927, former Knockaloe internee Viktor Ascherl (far left of the Photograph), brought his son back to Bohemia to see his parents and siblings. We are working with his family to retell the incredible experiences of an Austrian man and his English family, forced to spend so much time apart during two world wars. 100 years later his bed at Knockaloe has been once again allocated to him thanks to its generous sponsorship by his Grandson. 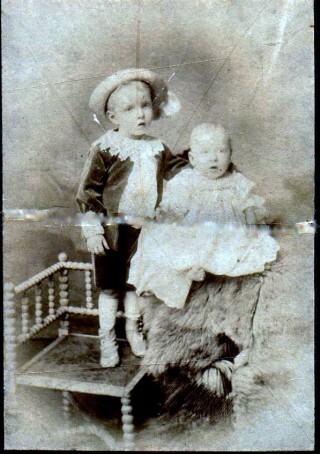 Our story begins around 1908 when Viktor, a young Austro-Hungarian, arrived in Britain. Like so many others, 20 year old eldest son Viktor had left his parents and five younger siblings in his homeland, taking the brave step to seek opportunities elsewhere. Viktor obtained a job as a waiter in a London restaurant and within three years he had met and married an English dressmaker, Bertha Chapman and was settled in London with two small sons. However on 12 August 1914 Britain declared war on Germany’s ally, the Austro-Hungarian Empire. With that, all of their hopes and plans for the future would be shattered. Despite being born English, Bertha had married an “enemy alien” and therefore would have also had to register as an “enemy alien” with her husband. Although Viktor was not actually interned until around September 1915, when wholesale internment of all “aliens” aged 17 to 55 had commenced, the time leading up to that point would have been incredibly difficult for the young family. With the increasing hostility towards “enemy aliens”, restaurants utilising German or Austrian waiters risked alienating their customers and so the majority of waiters would have lost their jobs quite early on. A saving grace for them all may well have been Bertha’s occupation as a home based dressmaker – and with her English birth, she should still have been able to find work. Victor would then have needed to take over looking after their two small boys and have possibly tried to seek ad hoc work. The family tells of Bertha switching to her maiden name at this time. This would have helped to get this essential work to earn the money to feed the family, and to reduce the hostility towards them. Whilst the aliens interned in 1914 and the first half of 1915 went into hastily arranged temporary (and often unsatisfactory) camps, as time progressed and more permanent purpose built camps were developed the internees were transferred into them. By the time Viktor was interned in September 1915, the largest purpose built civilian camp, Knockaloe in the Isle of Man had all four of its sub camps constructed and the train line directly into the camp inaugurated. It is likely that Viktor would have had to be repatriated, which would have meant a journey back to his parents and siblings, however it is good to know that, by 1925, he was again registered in England, as evidenced by his Aliens Registration Certificate. We do not know just how much of his children’s lives he missed and you would hope that Viktor and his wife could now spend time together as a family and rebuild their lives. But these were turbulent times and another war was looming. Ironically, this time Viktor found himself trapped on the other side of the line. In 1939 went back to his homeland to visit his dying father in Czechoslovakia (formally part of Austria), however with the declaration of WW2, Viktor was once again separated from his family for the duration of a world war. This time he was a citizen of the country and, at 50, too old to fight and so he was allowed to live peaceably and is believed to have worked as a postman. Meanwhile his two sons and his wife were evacuated to near Barnstable, Devon with her daughter-in-Law and children. Ironically, whilst their 29 and 27 year old sons, were conscripted into the British army, their father, Viktor, eventually found himself conscripted into the “Volksturm”, the German Home Guard, on the other side of the war. Yet again, for Viktor, the end of the war on 8 May 1945 was not to mean being immediately reunited with his family yet again. The family were now living in the area where the last shots of the war in Europe were said to have been fired as the Red Army advanced against the remaining German defence, in place even a the week after the war officially ended. On the “wrong” side yet again, Viktor and his relatives fled into Germany proper to avoid the advancing Red Army. Viktor finally managed to return to England in October 1946 where he lived a long life. Happily his sons both survived the war, although they only lived into their 60’s. Viktor died in 1979 at the age of 91, having outlived his wife and two sons. There is of course much more to find out and we shall keep adding to his story over time, as more information comes to light. We are absolutely delighted that Viktor’s grandson, Mike Ascherl proposed his sponsoring a bed at Knockaloe for a year for £25. Very appropriately he is allocated his Grandfather’s bed. Thank you Mike. There are many ways to become part of this project. We shall research every story regardless of whether that internee is sponsored as we know some people will not wish to do so or cannot do so. This project is a Registered Charity and is about giving, and anything we end up receiving along the way is so gratefully received, whether it sponsorship or simply supporting our facebook page and website and sharing our work far and wide to allow the archive to grow and to allow us to bring a little knowledge of all of the internees back to Knockaloe.